Localino Protect is a versatile localization system which allows easily to increase the security standard in your company. At the same time, our highly customizable system solution helps you to automate position-oriented mechanisms. Start a test and convince yourself now. Do you have questions about Localino Protect or would like to setup an individual localization system? Please contact us! 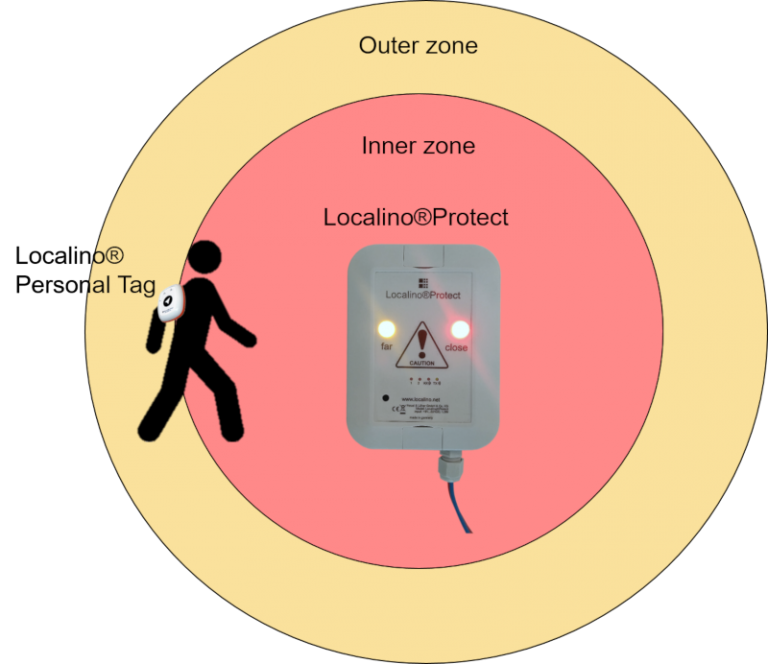 To use all functions of Localino Protect, you only need a Localino Protect base station and at least one Localino Tag. There are no additional components or additional software required. At the same time, no special infrastructure is required for data exchange. Base station and Tag are equipped with everything necessary and offer various functionalities. The tags are mobile transceiver units. Due to their compact dimensions and various mounting options, the personal tags can be easily worn by persons or attached to moving objects such as industrial trucks, pallets and packages, shopping carts, shopping baskets. Our industry tags are specifially designed for industrial environments. The batteries of the tags can optionally be recharged wirelessly. How does Localino Protect work? The Localino Protect base station and Localino Tags communicate by using so called Ultra-wideband-signals. Using this technology, the distance between base station and Tags can be determined with ultra high precision (centimeter accuracy). The base station allows to enable up to two different danger zones. If a Tag is located within the outer danger zone, the orange LED lights up as a warning signal. If a tag is located in the inner danger area, the red LED is activated. This way potential danger can be detected early, even behind corners and the situation can be assessed by corresponding countermeasures. With two additional digital outputs position-oriented interactions can be triggered. Additional communication interfaces allow to send commands to forklifts or actors. Use the power of Localino Protect to increase efficiency in your business. The base station can be installed on industrial trucks, machines with a corresponding danger area, on load cranes or other sources of danger. The tags are carried by the employees in the company as well as by visitors. Even in well-organized companies, industrial trucks, overhead cranes and machines pose a certain risk to people and materials. 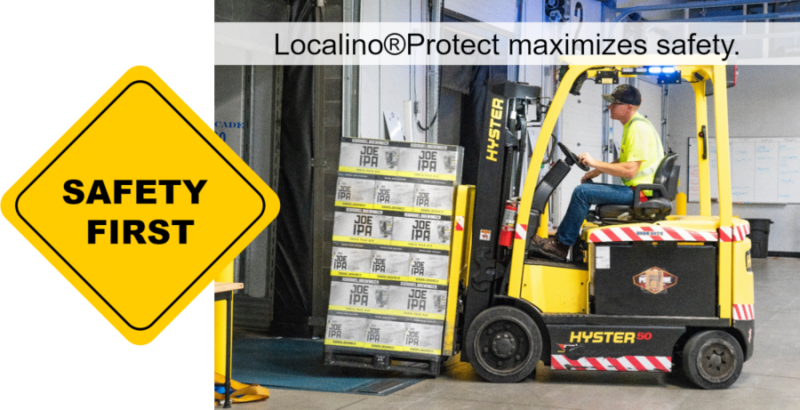 Localino Protect can make a life-saving contribution to your operational safety. 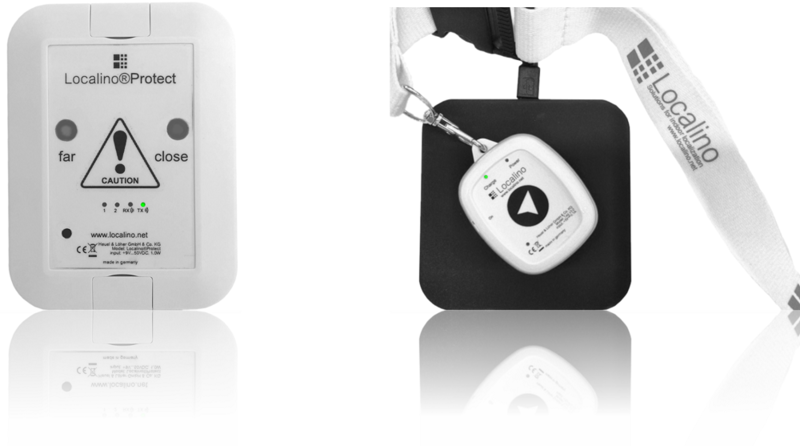 Equipped with a base station and at least one Tag, sources of danger can be recognized in a position-oriented manner and mitigation techniques can be applied at an early stage. Increase the safety standard of your company now! Localino Protect can increase the safety and the efficiency in your business. Equipped with a Tag and a Localino Protect base station, you can reliably and automatically open and close roller shutters. The control of the lighting system is also easily possible with our solution. You are unsure whether Localino Protect can be used in your business? You have your own idea for using our solution and want to know more about the possibilities of our system solution? We're here to help. Please don't hesitate to use our contact form!